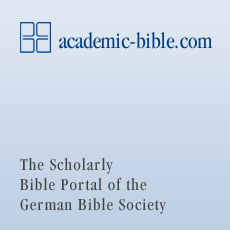 The publications from the German Bible Society are protected by copyright law. Please note that translations of the Bible and original text editions published by the German Bible Society are likewise subject to copyright. Permission is thus also required for the use of verses/passages from our Bible translations (e.g. Luther, Good News Bible) and the original text editions (Hebrew, Greek, Latin). Biblia Hebraica Stuttgartensia, edited by Karl Elliger and Wilhelm Rudolph, Fifth Revised Edition, edited by Adrian Schenker, © 1977 and 1997 Deutsche Bibelgesellschaft, Stuttgart. Used by permission. Nestle-Aland, Novum Testamentum Graece, 28th Revised Edition, edited by Barbara and Kurt Aland, Johannes Karavidopoulos, Carlo M. Martini, and Bruce M. Metzger in cooperation with the Institute for New Testament Textual Research, Münster/Westphalia, © 2012 Deutsche Bibelgesellschaft, Stuttgart. Used by permission. The Greek New Testament, Fourth Revised Edition, edited by Barbara Aland, Kurt Aland, Johannes Karavidopoulos, Carlo M. Martini, and Bruce M. Metzger in cooperation with the Institute for New Testament Textual Research, Münster/Westphalia, © 1993 Deutsche Bibelgesellschaft, Stuttgart. Used by permission. Septuaginta, edited by Alfred Rahlfs, Second Revised Edition, edited by Robert Hanhart, © 2006 Deutsche Bibelgesellschaft, Stuttgart. Used by permission. Biblia Sacra Iuxta Vulgatam Versionem, Fifth Revised Edition, edited by Roger Gryson, © 2007 Deutsche Bibelgesellschaft, Stuttgart. Used by permission. Lutherbibel, revidierter Text 1984, durchgesehene Ausgabe, © 1999 Deutsche Bibelgesellschaft, Stuttgart. Used by permission. Gute Nachricht Bibel, durchgesehene Ausgabe, © 2000 Deutsche Bibelgesellschaft, Stuttgart. Used by permission.